We launched Messenger Kids in the US one year ago after talking to thousands of parents and expert advisors in the areas of child development, online safety, and children’s media. We found that there was a need for a video chat and messaging app that lets kids connect with the people they love while putting parents in complete control. Over the past year, we launched the app in Canada, Mexico, Peru, and Thailand. We conducted parent roundtables in each country and have continued gathering feedback from parents and outside experts. This open and ongoing dialogue played a fundamental role in how the app has evolved. Based on parent feedback, we launched Sleep Mode in April, a feature that allows parents to set predetermined “off times” for the app on a child’s device. In June, with researchers from the Yale Center for Emotional Intelligence and a global group of advisors, we launched more new features rooted in principles of social and emotional learning, including the Messenger Kids Pledge, a set of guiding principles for parents and kids to talk about how to use the app responsibly. In our second year, we are focused on developing fun and meaningful features—including educational and SEL (social and emotional learning) exercises— as well as giving parents ways to connect their kids to their close friends and family. To help us do that, we’ve launched our new Messenger Kids Community, a private and diverse online group made up of hundreds of parents. We’ll speak with these parents on a regular basis to gather feedback that will help inform future features in the app. Mindfulness Exercise: Kids follow along with the in-app character, breathing in and out slowly to calm down and feel centered. After practicing deep breathing in the app, kids can use this skill anytime. 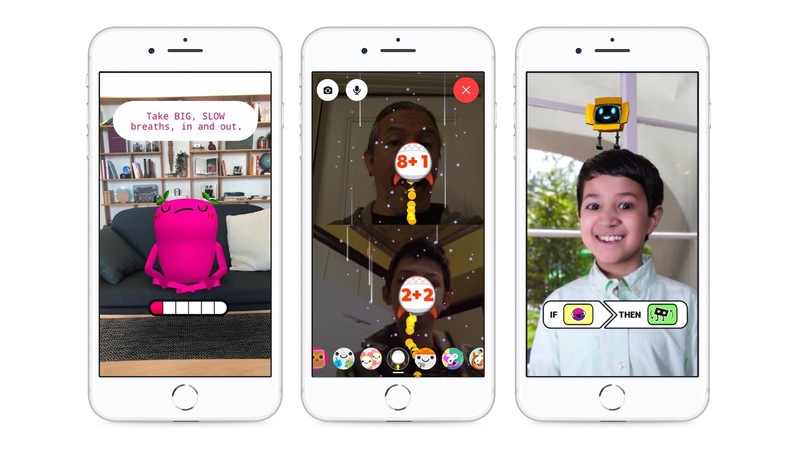 Math Comprehension: This space-inspired effect allows children to play and learn simple math problems together over video chat. Robot Coding Practice: Kids interact with a robot character to learn light coding skills by programming the robot to dance, jump and fly. 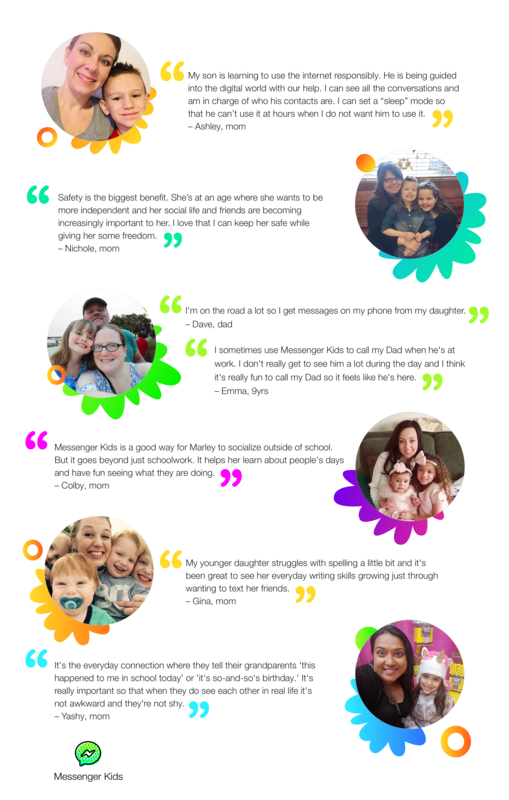 We spoke to families across North America about how they use Messenger Kids and how the app impacts their relationships and communication. See what they had to say below. To learn more about Facebook’s approach to building technology for kids and the questions we’ve discussed along the way, read our Hard Questions blog post. *These experts provide consulting services for Messenger Kids and we pay them for this work.